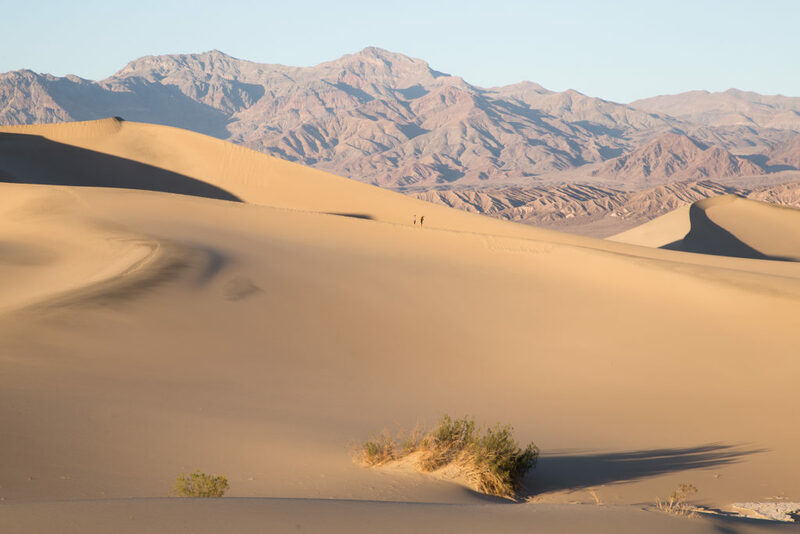 Death Valley National Park is a place of extremes: It holds the title for hottest recorded temperature on the planet (134 F), it’s home to the lowest point in North America (282’ below sea level), and it’s the driest place in the US (getting only an average of 2” of annual rainfall). It’s inhospitable and unforgiving, but if you look past its harsh first impressions you’ll find the park is undeniably beautiful. 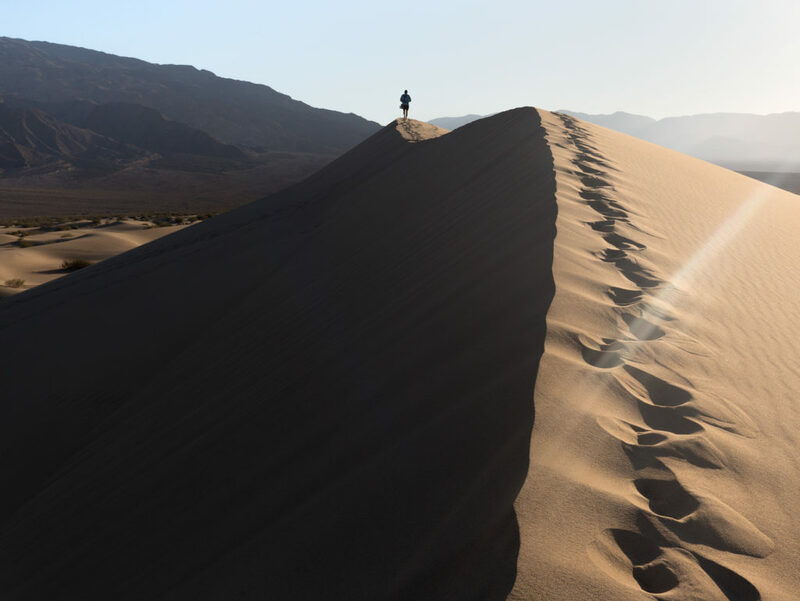 Towering canyons, undulating dunes, and a massive basin cover its 3.4 million acres and offer endless opportunities for adventure. Alex and I couldn’t wait to start exploring! After a long drive from Joshua Tree National Park, we arrived at the Furnace Creek campground. 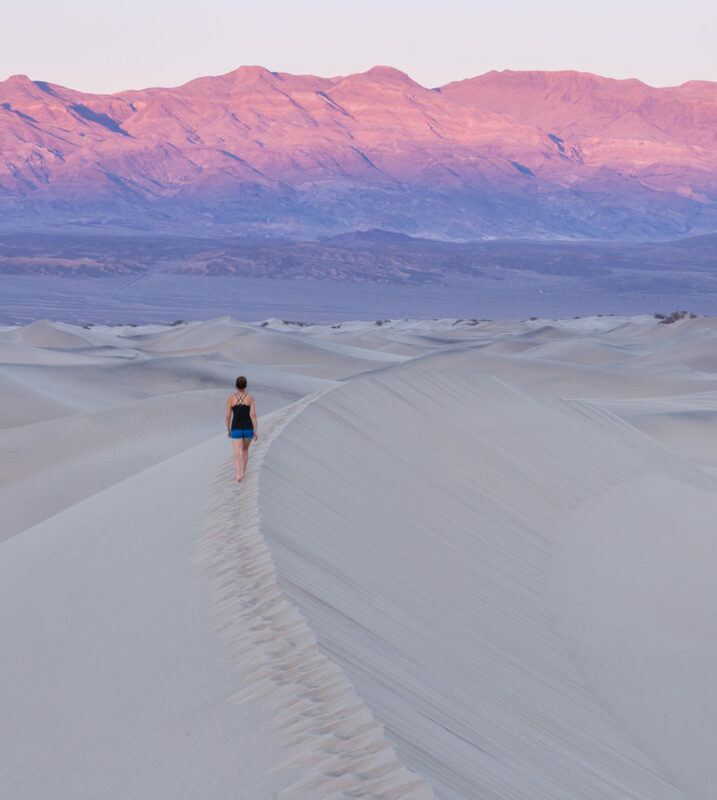 Everything in Death Valley has a foreboding name, and for good reason: Everything is formidable! It was late afternoon in mid-October and the temperature on the RV read 92 F. We stepped out of the vehicle and stepped into that distinctively dry air and thought, Ah, so that’s how it got its name! Since we arrived so late in the day we didn’t have much time to explore the park. We set up the RV, stocked up on a few supplies from the bare bones park store and ate dinner. After dark we built a fire. We thought the night sky in Joshua Tree was dark, but it was nowhere near as dark as the sky we saw in Death Valley National Park. With so little light pollution we looked up and saw billions of twinkling stars staring back at us. It was incredible. Eventually we had to pull ourselves away and head to bed —we had a long day ahead of us! Our only full day in the park began with a stop at the famous Zabriskie Point for sunrise. 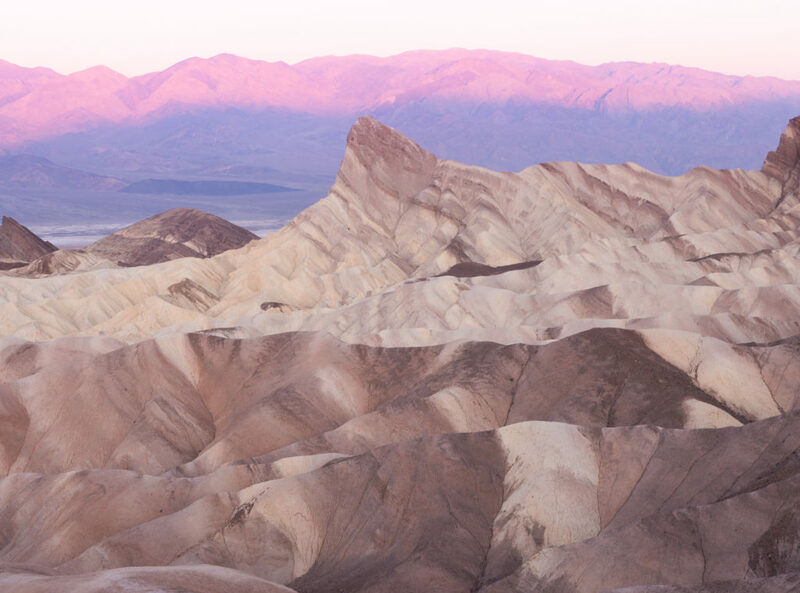 Zabriskie Point is one of the most photographed spots in the park, and it’s easy to see why. In the early morning the sand dunes turn a purple-pink color as the landscape behind them slowly begins to brighten, as if dipped into light. After sunrise we returned to the campsite and made coffee and oatmeal. We sat in the shade of the RV’s awning and the temperature in this shade was perfect. We decided to spend a few unplanned hours just reading and relaxing in and around the RV. 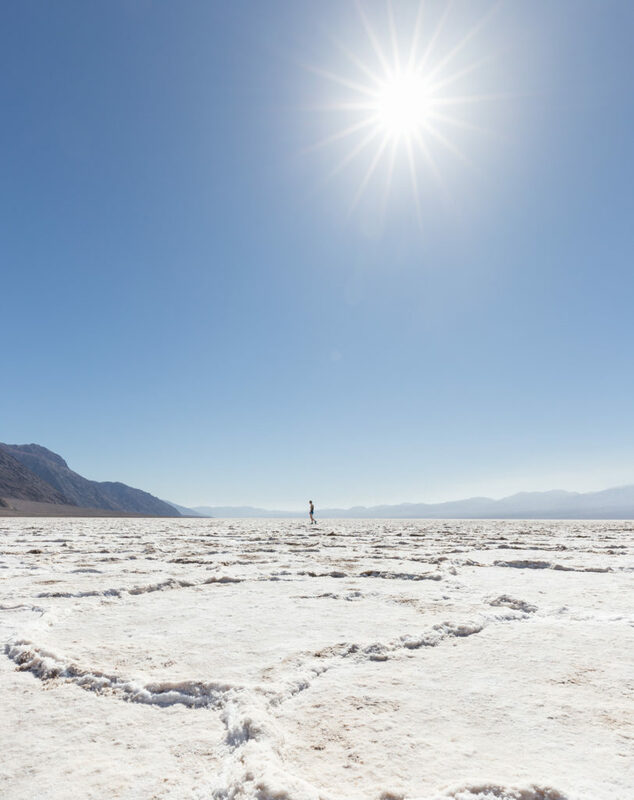 The second stop of the day was Badwater Basin, the lowest point in North America. The place is in a word “otherworldly,” as the salt flats with vein-like ridges stretch on for miles. We walked and walked and never seemed to be getting any closer to the mountains across the valley. It was a harsh spot, with no shade as far as the eye could see and not a cloud in the sky. We felt ourselves burning so we made our way back to the comfort and conditioned air of the RV and headed for the final spot of the trip: Mesquite Flat Sand Dunes. 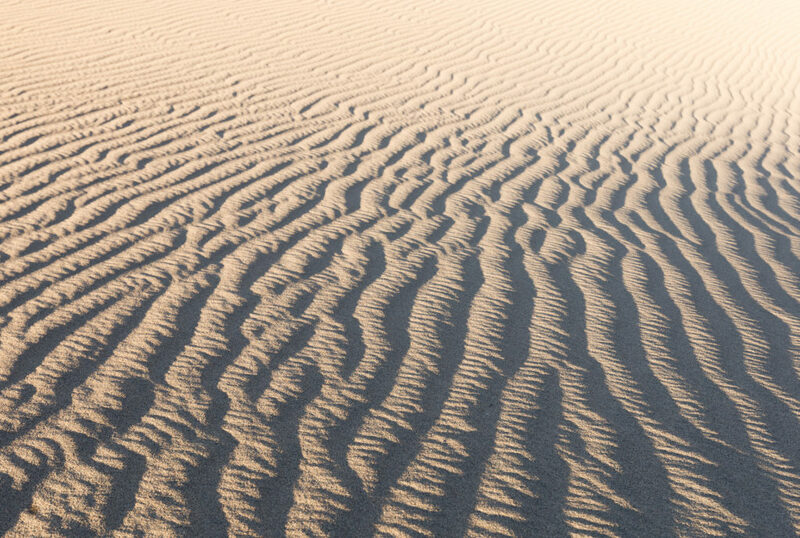 There are five dune fields in Death Valley but the most easily accessible are the Mesquite Flat Sand Dunes. We decided to visit these at sunset so we could watch the dunes change color and as we would soon find out, it was the perfect choice. The sand dunes have no trail so we made our own way up, over, and around the massive sand mounds until finally we found one that was more secluded and had a stunning vantage point. Then we settled in for sunset. By this time most of the park goers were leaving the dunes so we quickly found ourselves quite alone. The dunes slowly began to change color, first from yellow, to gold, and finally to a deep orange right before the sun disappeared behind the far horizon. We thought the show was over but noticed that the mountains in the west began to glow pink and the sand was almost purple. It was spectacular! We watched the light for awhile longer but then we started to head back. We didn’t want to hike too far in the dunes in the dark and risk stepping on a snake! That sunset marked the end of our road trip through Joshua Tree and Death Valley National Park. The desert, although seemingly void and barren, still exudes such beauty. As we drove back to the campsite, we once again found ourselves under a blanket of stars. I looked out the window and smiled. This trip through the desert was truly awe-inspiring. The Yosemite Campsite Reservation Countdown! Start your travel experience now. Don’t let your RV sit, consign it. Learn more.